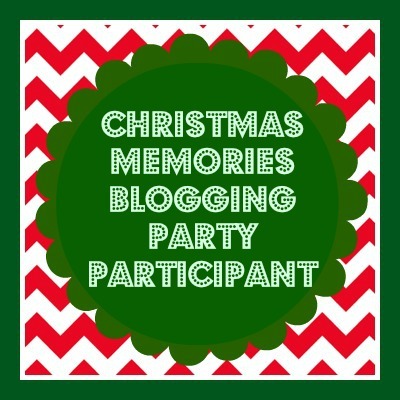 I’m happy to join 22 of my fellow bloggers in a Christmas Memories Party. I hope you check out the other participants’ posts as well. Have a holly, jolly Christmas! This time of year I can’t help but remember how Mom made Christmas special for us when we were kids. Her memories of Christmas as a child during the Great Depression are that of all her gifts fitting on one chair. Usually there was an orange, some nuts, some simple candy, and one toy. She said she sneaked out to the kitchen on a pre-dawn Christmas morning because she was too excited to sleep any longer. It was so dark that she accidentally set off the tin wind-up toy of a small duck that was on her chair. It quacked loudly and kept quacking as it skittered around on the floor for a while. Mom was so scared that she ran back to her bedroom and jumped into bed. She says it is one of her earliest memories. 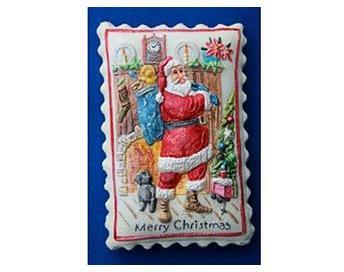 My earliest memory of Christmas is when I thought I saw Santa Claus in the living room sitting on our couch. The bedroom I shared with my sister was adjacent to the living room and I could barely make out Santa through the cracked door. The fact that I was near-sighted probably helped the illusion. I stayed in bed to be sure I wouldn’t disappoint Santa by coming into the living room when I was supposed to be in bed. Still, it was thrilling to know he was in the softly lit room so close. My dad worked for the railway mail service, sorting letters on a train between cities. He worked 10 days on and then had 10 days off. His schedule did not always coordinate with Christmas, so we “had Christmas” when he got home. I remember so well standing at the window watching for his car lights coming up the street. The window got fogged up by our breath and we had to wipe it clear to see. At the time we just wanted Dad to get home so we could open our presents, but now I see that the anticipation of Dad coming home was really the best part. Mom believed in the power of cookies. Every December she’d start her quest to have plenty of cookies for the Christmas cookie tray. 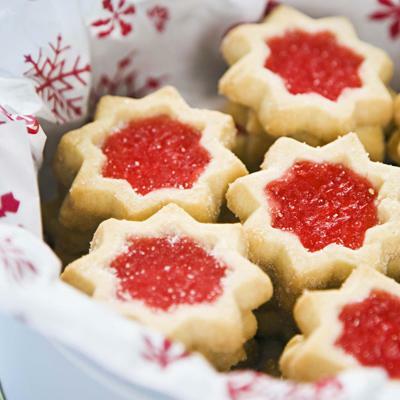 She baked a different cookie recipe every day until Christmas. All of the cookies went into the freezer with very limited sampling! She had a hammered aluminum tray given as a wedding present that was about 24 inches by 18 inches. She’d line up the cookies so that every row was a different kind of cookie. It was always a pretty sight and she let us kids arrange the cookies. She always watched to see which cookies were the last ones eaten. That cookie recipe was dropped the following year and a new one tried. Eventually, all the cookies she made were pretty much irresistible. She always would ask us which one we liked best and it was a kind of tradition that we all knew who liked which cookies. Dad’s favorite was Snack Time Molasses Cookies, Mom liked Cornflake Coconut Kisses, my brother liked Springerles, my sister loved the Scotch Shortbread circles with candied fruit on top, and my favorite was Walnut Surprise Squares. Mom let us roll Snickerdoodle dough into balls and dip them into colored sugars. We painted Springerles and were so pleased with our work! As the grandchildren came along, they threw in handfuls of chocolate chips and nuts. My daughter got to arrange the cookies on the tray. Mom is 93 now and doesn’t make cookies much anymore. She gave the aluminum cookie tray to me and we used it at our son’s wedding rehearsal dinner. We had simple traditions for Christmas, like hanging red and green bottle brush wreaths at the windows, singing Christmas carols while Mom played the piano, decorating the tree, attending midnight Mass, and driving around to see the Christmas lights. But it’s Mom’s cookie tray that is my touchstone. Every time we use that tray it brings back memories of Mom’s beautiful cookies and the warmth of family! I wish you a special Christmas season and I wish you cookies! 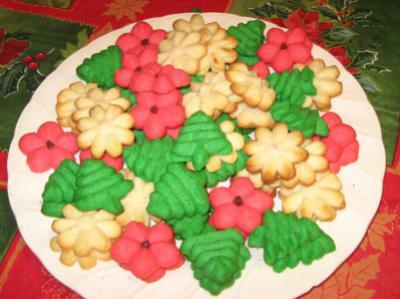 Here is a link to Mom’s famous Gold Cookies that were on every cookie tray. She always made them in tandem with Cornflake Coconut Kisses because the gold cookies use egg yolks and the coconut kisses use egg whites. No waste, and so much yumminess! A special thanks to Sicorra at Tackling Our Debt for organizing this Christmas Memories Party and having the idea for it! Click here for links to the other posts in this Christmas Party. Enjoy! I’m glad I wasn’t the only one! Thanks! This has been really fun. Wishing you a wonderful Christmas, Paula! Cat, it’s been fun! 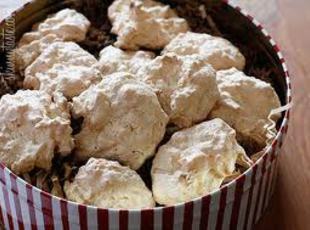 The cornflake kisses are like a chewy meringue. So good! I enjoyed participating in this party with you mostly because yall have some AMAZING cookies on your sites that I cannot wait to go and find when I fly home!!!! Thank you KK. I’m going to have to make those molasses cookies this year. They are so chewy and so good! Glad to bring back your molasses cookie memories! Sorry, Catherine, I don’t make those. Any spritz cookie recipe should work. Mom always just used a basic recipe that came with her cookie press. I know it had a lot of butter in it! Those cookies look so good! I received a cookie press last year but have yet to use it…need a good cookie-press recipe. Have any?! What beautiful memories. Like your dad, my favorite Christmas (or anytime cookie) is a Molasses Clove cookie. Sweet and slightly spicy. It’s amazing how many memories are “stored” in food. Just the taste of a Molasses cookie brings me back to my childhood. Thanks, Holly! And you have a very Christmas-y name! Cookies are something everyone can make!